This is the second volume in the Doric String Quartet’s series devoted to Haydn’s String Quartets. Op.76 turned out to be the last full set of six string quartets that Haydn was to compose. While they were written over the period 1796-97, they were not published until 1799. They had been commissioned by Count Joseph Erdödy, and such arrangements often entailed, as in this case, a period of time during which the works were reserved for that person’s exclusive use and enjoyment. The composition of Op.76 coincided with Haydn’s work on Die Schöpfung and the first few of the six masses which Haydn wrote for the name day of Princess Maria Hermenegild Esterházy, and one can readily imagine that such compositional preoccupations rubbed off onto the composition of the quartets. However, that cannot be equated with a particular predominant ‘opus character’, a feature of some of Haydn’s previous sets. 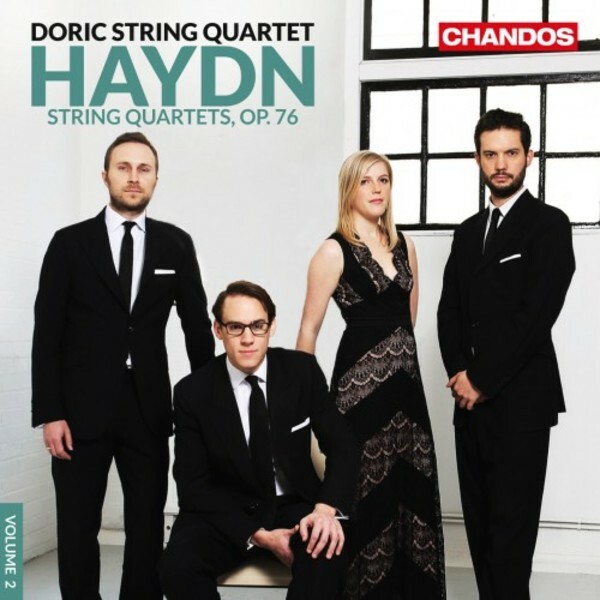 Rather – like Op.20, also recently recorded by the Doric String Quartet (CHAN 10831(2)) – the quartets seem to be most remarkable for their sheer variety. If there is anything they take from works such as Die Schöpfung, it is sheer plurality of stylistic references, a sense of traversing an entire world of musical possibilities. Learned and rustic elements, for instance, are given exceptionally vivid treatment, and there are also passages of the greatest intimacy and grandeur.